7:08am…October 20, 2014…my doctor left me a voicemail telling me that I had breast cancer. But…this is not a blog about breast cancer (maybe a little about breast cancer). It’s my story about how that one significant moment was a catalyst for a year-long journey of writing and “collaging”, that changed ( and healed) my life, in a creative and profound way. It actually started when my friend, Sandra, sent me a link to a year-long art journaling challenge. I’ve said over and over that I want to do an art journal, but until then, it was just words. Now, the time seemed right. So, I checked out the link and immediately registered, making a commitment that I had no idea would have such a powerful impact on me. For the first two weeks, I followed the challenge as it was presented. We were given a monthly theme, and a weekly art challenge and journal prompt. The task was to create a journal page that would reflect all of these. I loved seeing what the other people were creating, but I was struggling with the process. While art journaling is a wonderfully expressive process, because of where I was, it wasn’t the process that I needed. I listened to that and changed my tack. The third week, I started journaling each day and at the end of the week I collaged over what I had journaled. 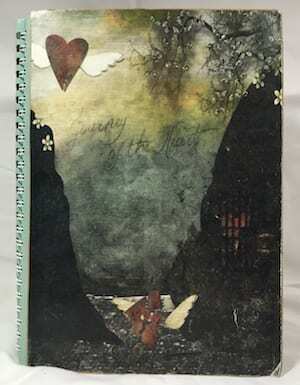 This is not art journaling in its truest sense, but what I’ve come to call artful journaling mindfully…one of several ways that I use collage when I need to explore and get to the bottom of what’s really going on inside of me. Basically, I was making two collages each week that expressed my thoughts and feelings for that week. Truthfully, I went into this challenge with the intention that it would be the creative outlet I needed to help me process and make sense of what was happening to me and to my body. I believed that artful journaling would allow me to express the things that I couldn’t talk about to anyone else. But over the year it became my voice…giving expression to parts of me that I had silenced but that longed to be heard, and slowly giving those parts back to myself. 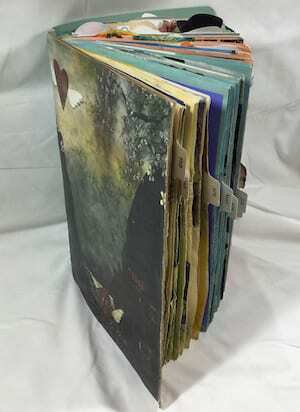 So, I’ll end this first post with my intention for this blog: I want to share my journey with artful journaling, with the hope that it will inspire women to listen to their creative voice, and begin their own journey with Mindful Collage™. Looking forward to sharing more of your journey.